The Oral History Center is pleased to release our life history interview with famed civil liberties lawyer, Marshall Krause. 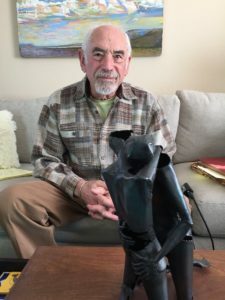 Marshall Krause served as lead attorney for the ACLU of Northern California from 1960 through 1968 and subsequently served as an attorney in private practice where he continued to work civil liberties cases. Krause attended UCLA as an undergraduate and graduated from Boalt Hall, UC Berkeley School of Law after which he clerked for Judge William Denman and Justice Phil Gibson. In this oral history, Mr. Krause discusses: his upbringing and education, including his time at Boalt Hall; clerkships with judges Denman and Gibson and how those experiences influenced his progressive political outlook; his tenure as ACLU staff attorney, including many of the cases he worked; his experiences arguing several cases before the United States Supreme Court; his perspective of the San Francisco counterculture of the 1960s; and his professional and legal career after leaving ACLU in 1968, which included arguing additional cases before the US Supreme Court. This oral history is significant for any number of reasons, but it is especially worthwhile for anyone interested in the current state of battles around the freedom of speech — from obscenity through political speech — and how these were decided in the courts in decades past, establishing the precedents under which we live today. 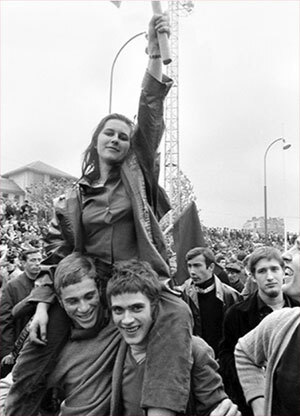 Les événements de mai 68 (the events of May ’68) or Mai 68 (May ’68) refer to the socio-political and cultural contestation that took place in France between May and June, 1968. Student protests at universities in Nantes, Brest and Nanterre were eventually joined by a general strike involving some 10 million workers, nearly 20 percent of the population. While the movement, or events, which lasted nearly 6 weeks failed to transform the state, it did have an indelible impact on French society, forever changing the social space and opening up a terrain for new social movements. As May ’68 approaches its fiftieth anniversary, the Mai 68: Library Research Guide created by Claude Potts, Librarian for Romance Language Collections, serves as a starting point for interdisciplinary research of all levels into this specific historical moment and also commemorates the ways the movement opened up a broader discourse into social emancipation, including feminism, anti-racism, ecology, and gay rights. As home to the Free Speech Movement and the first large-scale protest against the Vietnam War in 1964, UC Berkeley has a special connection with May ’68, and the depth of our library collection on the topic is a testament to that transatlantic link. 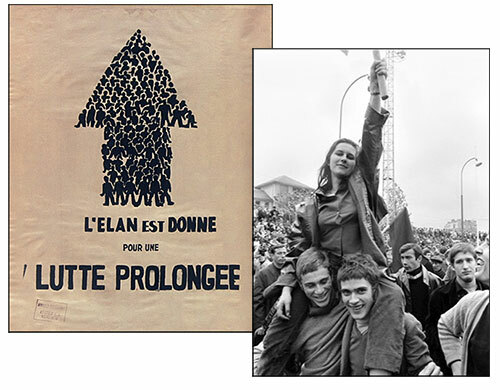 Poster from Atelier populaire, 1968 retrieved from Gallica; Photo by Bruno Barbey of students and workers in Charlety stadium in Paris. May 27th, 1968 retrieved from ARTstor. As May ’68 approaches its fiftieth anniversary, the Mai 68: Library Research Guide serves as a starting point for interdisciplinary research of all levels into this specific historical moment and also commemorates the ways the movement opened up a broader discourse into social emancipation, including feminism, anti-racism, ecology, and gay rights. As home to the Free Speech Movement and the first large-scale protest against the Vietnam War in 1964, UC Berkeley has a special connection with May ’68, and the depth of our library collection on the topic is a testament to that transatlantic link. We compiled this for our incoming freshman class, but you, too, may be interested in this great list of suggested reads related to this year’s theme of Free Speech.